Selecting the wrong shaving cream can result in painful nicks, cuts and burns. You’re also left with your skin still feeling rough and dry. This only leads to more issues in the future. But don’t fret. If you are looking to buy the best shaving creams available right now, read on. We’ve compiled a list of 12 magnificent shaving creams that are available at the market in 2019. Some of them will make your face feel smoother. Others will moisturize your skin so you feel fresher. Take some time to go through the list and decide which one will suit you. 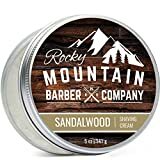 Shaving creams made by Rocky Mountain contain coconut oil and natural glycerin to help prevent irritated skin in the most organic way possible. The cream is versatile so you don’t even need a shaving brush to apply it although it doesn’t build up a decent lather. It does contain Sandalwood which not only gives it a pleasant scent but also soothes your skin. 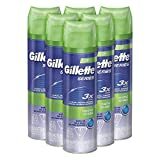 The secret to Gillette Shaving Gels is aloe. This ingredient freshens skins, leaving you feeling rejuvenated after a shave. The gel softens the hair before you begin so there’s less irritation when you’re done. The only issue is that the cans tend to stop working after a while so you might not be able to get all of the foam out. 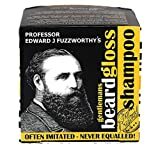 Professor Fuzzworthy uses rare ingredients from Tasmania to make sure there’s no itching after you shave. There are no harsh chemicals that can damage your skin so it’s left feeling smooth and nourished. If you’re only partially trimming your beard, you may need conditioner as this soap can sometimes leave your facial hair feeling dry. If you’re looking for a shaving cream that lathers well, why not try The Art of Shaving? This cream becomes extra foamy which allows for a fantastic glide so you can get a decently close shave. It’s a bit pricy, but you’re guaranteed a luxurious feel and smooth skin. The cream even has a subtle sandalwood scent so you feel fresher once you’re finished. 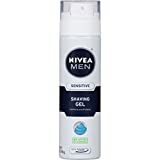 Nivea for Men creates an extra thick shaving gel so that you can prevent any cuts or burns, which is ideal for sensitive skin. The brand uses chamomile and Vitamin E so that your skin looks healthy and refreshed after every use. Chamomile does leave the foam smelling a bit feminine, but it’s a clean, soothing odor. Billy Jealousy uses advanced hydroplane technology to produce a foamless shaving cream so you can neaten your beard no matter where you are. It uses natural oils that are similar to skin oils to rehydrate your face so you feel revitalized. These ingredients can sometimes leave your skin feeling oily but this only happens to a small percentage of consumers. If you prefer the traditional means of using a shaving brush, Taylor of Old Bond Street is an ideal selection for you. 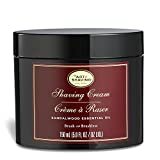 This cream is silky and delicate giving your face a soft feel after a close shave. It has a very smooth glide and a sweet, subtle scent. The container does have the issue of spilling occasionally. Truefitt & Hill has been a top choice for London barbers since 1805 and this is because of the quality of its products. It offers a glycerin-based shaving cream which allows for a comfortable shave and it has a pleasant oceanic, spicy scent. It’s recommended to use a shaving brush although this is not always required. If you’re looking for a creamier shaving product so that your face feels smoother, you should try Cade Shaving Cream. This wonderful product includes shea butter so that your face feels softer and healthier than it did before. It’s a bit costly but you’re ensured a decent lather so the product will last you a while. If we had to pick a favorite, V76 by Vaugh would be the one. The gel-to-cream formula is capable of softening the worst stubble so you get the smoothest shave. It uses vitamin E beads to not only exfoliate your skin but also enrich it with moisture, making it perfect for dry skin. This also soothes your face so there’s no irritation. Jack Black boasts a three-in-one product that works as a pre-shave oil, shaving cream and aftershave and it pulls this off effectively. It uses macadamia nut products to moisturize skin and prevent any razor burn while also having anti-bacterial properties. One issue is that it’s transparent so it’s difficult to track your shaving progress, but it’s vegan-friendly which is a benefit. Treating dry skin can prevent any bumps and skin tears in the future, which is why Aveeno’s Therapeutic Shave Gel is so beneficial. While you’re shaving it reintroduces moisture back into the skin and protects it without blocking pores. It’s also extremely affordable although there are sometimes cases where it doesn’t lather well. Taking care of your skin is necessary if you want to keep it looking amazing. Shaving too often can damage skin and leave it dry unless you use a fantastic shaving cream. At least one of the creams on this list will help you take care of your skin so you can look sleek and debonair. We can’t tell you which one will be best for you, but now you know which ones are worth trying out first.